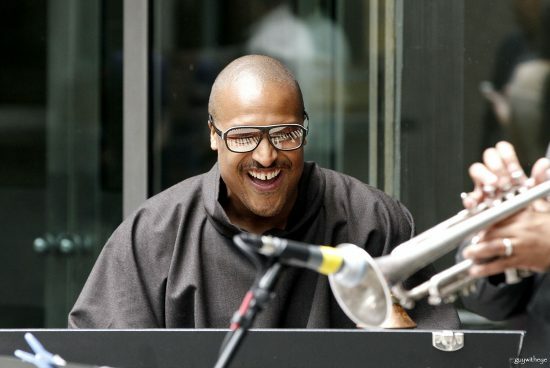 Lewis, a New York–based keyboardist and composer, is both one of the modern jazz masters of the Hammond B-3 organ and a Thelonious Monk specialist. His latest release—Organ Monk Blue, a trio with guitarist Marc Ribot and drummer Jeremy Clemons—is one of four albums on which he finds his own voice within Monk’s music. Like many B-3 players, he learned to play piano before taking up the organ. He got serious about the Hammond while studying at the New School in New York and likens the process of transferring his keyboard skills to the instrument to learning to drive a stick shift. Behind those Hammond pedals and keys, there’s a lot going on. Engineer Laurens Hammond, who invented his namesake instrument in 1934, had pioneered a synchronous motor to produce a soundless electric clock a decade earlier. He repurposed this invention for his organ, in which each of 61 keys is assigned nine mechanically rotating wheels, whose electric current is read by electromagnetic pickups and fed to an external speaker cabinet. The instrument’s sound is manipulated through a series of drawbars—metal sliders, not unlike those on a mixing board, that control volume and harmonic content. Early adopters of the Hammond organ included Henry Ford and George Gershwin. The instrument quickly found a place in thousands of American churches as a lower-cost alternative to the traditional pipe organ, and it became closely associated with gospel music. It was also used in radio studios, for both music and sound effects. 1954 saw the introduction of the B-3, which would prove to be the company’s most popular model. In the 1950s and ’60s, it emerged as a commanding voice in jazz and popular music. Jimmy Smith used the instrument to set the prototype for the jazz organist, using its bass pedals to mimic an upright bassist, while at the same time playing virtuosic lines with both hands. Rock and R&B musicians like Steve Winwood, Keith Emerson, Booker T. Jones, and Billy Preston harnessed the instrument’s growling sounds to excellent effect. The original B-3 was phased out of production in 1974. Although Hammond’s newer digital versions recreate the instrument’s sound and feel, many players, Lewis included, prefer vintage examples. The original B-3s were built like tanks—“hard to destroy, unless you just literally sit them out in the water or throw them off a cliff or something,” as Lewis, who in 2012 lost a prized old Hammond to Hurricane Sandy flooding, puts it. Do you want more Chops? Download The Best of Chops for free.